This time last year I had just wrapped up a trip to ADMERICA! 2014 as one of the conference bloggers. Once a year, the American Advertising Federation’s national conference brings together a slew of creative minds to learn, network, and celebrate the winners of the American Advertising Awards. Wednesday kicks off the ADMERICA! 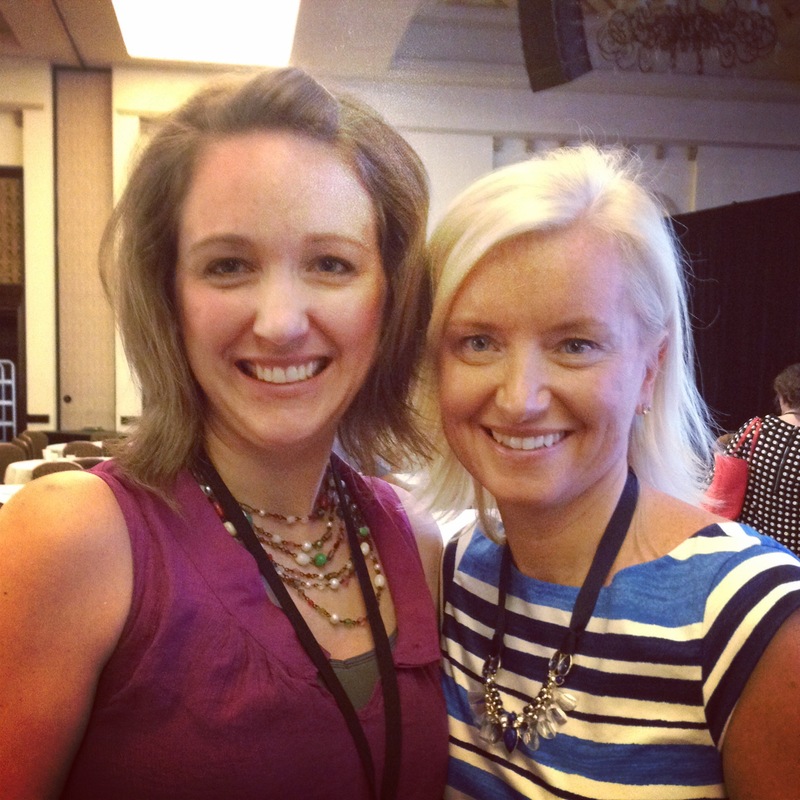 2015 conference in Vegas. And, I’m blogging again! The speakers on tap this week pretty much blow my mind, just like last year, which included AOL’s David Shing (aka @Shingy) and Facebook’s Carolyn Everson (plus many others). Last year as I was settling into a Friday morning conference session, I noticed a woman with bright blond hair, cobalt heels and a striped blue and white dress making her way around the room. She paused at each table, taking the time to not only introduce herself, but also to thank each person for attending. 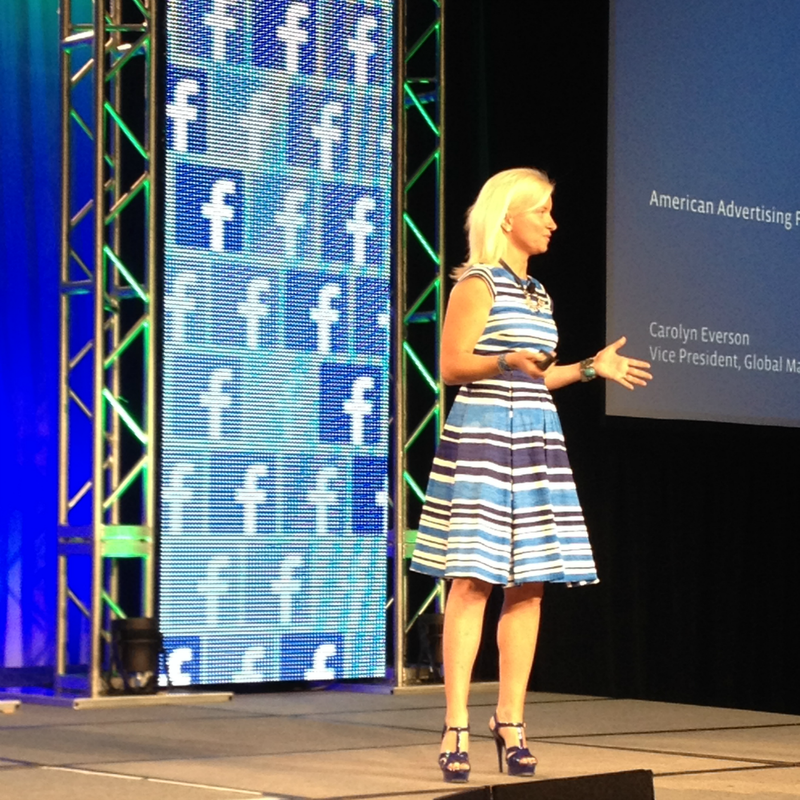 I didn’t put two and two together at the time, but I was watching keynote speaker Carolyn Everson work her magic and practice what she (as Facebook’s VP of Global Marketing Solutions) preaches. It’s all about connections. People are the backbone of our industry. They want you to be your authentic self. It seems simple, being “your authentic self.” But it’s not. If it were, everyone would be doing it perfectly, engaging with their customers and prospects online, creating conversations and community. But, how do brands make it happen, and where should marketers focus? Ask the person sitting next to you, “How often do you check you phone?” Most people won’t be able to tell you; they’ll struggle to come up with a number. On average, people check their phones over 100 times a day. ONE HUNDRED times a day! Checking your phone is becoming so instinctual it’s like blinking your eyes. Digital has overtaken television in usage per day, much like television overtook radio half a century ago. Americans spend over five hours a day on a digital device, and only four-and-a-half watching television. The driver is mobile. The question is, are you there? And are you doing it well? Our industry is about people, and personal connections allow us to bring people back to the center. Facebook’s goal is to connect the world, and of the seven billion people worldwide, only one third is online. Eighty percent could get connected if they wanted to, so why haven’t they? The answer is simple: lack of awareness and cost. Mobile could be the key to more engagement. Worldwide, it’s easier to get online with a mobile device. If we had started Facebook three years ago, I’m not sure we’d have such a robust desktop site. Mobile is not going away. In fact, more people are using mobile today than anticipated a few years ago, and that shift happened quicker than even Facebook was ready for. Realizing that consumers preferred the mobile experience, Facebook took 90 days and 3,000 coders to build a respectable mobile presence. It was a brave move, but a necessary one. Everson would argue that the majority of the industry is behind on mobile, and yet – that’s where the consumer is; they need to be there. Over 60% of people in the United States use at least two devices every day, and more than 40 percent of consumers start activity on one device and finish on another. Consumers are also visual creatures. In addition to shifting gears and focusing on mobile, Facebook made a key acquisition when it purchased Instagram in 2012. Instagram started off as a phone app only, although it now has a basic desktop presence. It’s HIGHLY visual, and brands are starting to understand just how powerful it is in terms of connecting with people. Everson shared numerous times that their goal with Instagram and Facebook is to make a “fantastic and delightful experience” for users. Multi-touch attribution models that value impressions are better estimates of ground truth than click models. Current measurement of effectiveness won’t work in the future. The industry has to evolve. Every consumer will have a connected device personal to them. Marketing will need to become much more personal. Measurement needs to get better to understand how and where to spend money. So, if people are the backbone of our industry, and if we must understand how to be more personal and thoughtfully present where our consumers are, what did Everson share about changes Facebook has made to meet those needs? Marketers using Facebook can reach everyone in the U.S. But, Everson argued that’s not really the point. The point is to be personal and relevant to the right people. Facebook has given marketers the ability to reach segments like homeowners, diet drink consumers, and medium to heavy cosmetics users. Or, the ability to hone in on specific demographics like the LGBT community, new parents, Native Americans, and so on. [Marketers should] take that big number and get it down to the people that matter to you, no matter what your business objective is. But, it doesn’t stop there. Marketers have to be engaging, funny and clever. They have to also understand how to make that fantastic and delightful experience for their consumers – brands have to come to life! Brands also have to be BRAVE. They have to be prepared to respond quickly, be in the conversation and have dialogue with consumers. They have to plan for real time, but also act in real time. Brands, businesses and marketers need to understand the importance of embracing the “mom and pop shop” mentality of yesteryear, where every shop owner knew his customer beyond the purchase. Targeted, relevant and granular ads are becoming more important – especially in spaces like Facebook and Instagram where consumers are in an environment of discovery mode. It’s about making business personal, again. It’s all about connections. What great advice and I agree that I do check my phone very often daily, as it is my lifeline for all I do online networking and such, too. And, that’s probably going to keep growing and become more important – crazy, right? Thanks, Briton! I think even if you’re not working with brands yourself, you can spin the messages to relate to your own blog marketing and focus. You know? That is awesome info! I love that we’re getting personal again. The mom and pop shop on a wide scale is an intriguing concept! Wow makes me what to turn my phone off ! I really learned alot from her and wish I could have heard her speak! I forgot my phone yesterday when I took the kids to the pool and I freaked out a bit at first! LOL! But then I got over it. Interesting points about marketers and FB.